Tango promises big things ahead - now it just needs the software to get it off the ground. Update: the first Project Tango phone is going to be unveiled tomorrow, and it's a handset from Lenovo. We'll update this review of Google's ambitious AR platform when we try it out. Smartphones have stopped getting smart. Better looking? Yes. Improved build quality? Sure. More powerful? Absolutely. But smarter? Not so much. It's very much the same story with tablets, although Google is attempting to push things forward with its hugely ambitious Project Tango. You've probably heard of it - this is Google's shot at making a device that can see the world around it. Thanks to a series of cameras and a depth sensor, Tango is aware of space and motion. Google's made its name in collecting information from the world around us, so it should know what it's doing here too, right? After all, Tango's technical lead, Johnny Lee, helped develop Microsoft's Kinect and had a hand in the functions of the Wii Remote. Tango is really only meant for developers right now - the dev kit can be ordered through Google's Play Store for the cost of around $1000 (around £655, AU$1282). Lenovo has now confirmed it will be releasing a smartphone with the Project Tango technology in it during "summer 2016". Lenovo has said it will, "allow users to experience the world in ways never before possible through a smartphone". And I agree, it will. That phone will be a better piece of hardware than it is now. The developer version has a 7-inch screen, runs on an Nvidia Tegra K1 processor, and sticks in 4GB of RAM, none of which is bad at all - but this is just a start. It's also laden with sensors; on the back is a depth sensor, infrared camera, fish-eye lens for tracking, and an infrared projector, while you've got one camera on the front. Together, they capture hundreds of thousands of impressions of their environment, wherever the tablet is placed. It's not a pretty device, but the final product is sure to be a much better looking thing. This is just a developer device after all. I was really impressed by both the speed and accuracy of Tango. The first demo I tried put me inside a car where I was able to walk around, leaning forward for a closer look at the dashboard and crouching down to inspect the brake. Every step I took was recognised by Tango, which took an identical step in the same direction. After walking "through" the car door I was able to admire the vehicle from the outside, even changing the colour of the paint if I wanted to. This could one day be how we browse things before we buy them. There are a lot of neat ideas being tried out right now, and when you start looking at Tango's augmented reality uses, truckloads of potential applications come to mind. Perhaps you could assess how that red sofa might look in your living room, or whether there's a more suitable wallpaper for the bathroom. In fact, apps that do these sorts of things with Tango are already being made. In one, the screen displayed a picture of the world behind it that would have been completely accurate were it not for the fridge that had been digitally plunked in the middle of the room. I walked towards it and eventually strolled through the fridge door to find myself inside the cold storage, yoghurts and half-eaten cheese suddenly blocking my view. On a separate occasion, techradar also took Project Tango around the Museu Nacional d'Art de Catalunya in Barcelona. The exhibit was mapped up by the device by walking through the museum one way and exactly the same route but the opposite way. That's how the 180-degree camera can recognize the environment. From there the museum then added in information about art works and the locations of each piece. 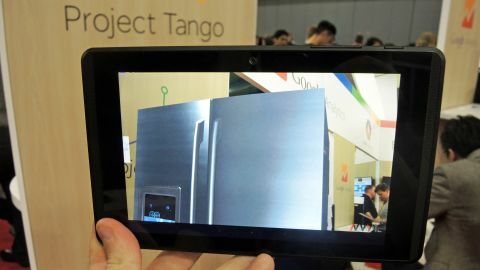 When Project Tango was booted up you can then head in and see different exhibits and more facts that plaques to the side can do. While Tango feels like more of a developer's toy than something anyone would buy, there's a lot of fun to be had with it. I also tried out a number of games, including a sort-of-first-person-Pong that required me to use the tablet as my paddle. There was also a virtual reality experience that filled the room with water. The tablet camera passthrough meant I could see the people around me, but it was like they were watching me from outside a glass tank as fish swam around my head. The cost of the final version, expected to appear some time this year, will probably be close to that of the development kit. That means this won't be cheap, so it's going to need some truly astonishing software if it wants to take off. The hardware is already impressive, and object mapping is fast and accurate, but Google needs a) a lot more software partners and b) a number of killer apps that put all of these tricks to good use. As a positional tracking virtual reality headset, it's already ahead of a lot of others out there, most of which rely on an external camera or sensor in order to work. Everything Tango needs is wrapped neatly inside its plastic shell. It's hard to conclude anything on a device that's meant to be little more than a box of (rather awesome) tools right now, but Tango promises a future in which augmented reality is much more than the gimmick it is today. Plus confirmation from Lenovo that it will release a Project Tango phone by the end of the year is a great step in the right direction and proves the technology is being taken seriously by manufacturers. Not all of Tango's big use cases will be for general consumers, but the tablet's ability to map its surroundings with such accuracy, and in such a short space of time, means a few killer apps is probably all it needs now if it wants to end up in the column of Google's successes.